Rise of Rohan has been out for a few weeks now and I’ve been busy enjoying myself in the new content. Ked and I got our first characters to level 85 last night and I thought it was time to show you some of the outfit ideas we have been playing with in this new expansion. This is the outfit Ked is currently sporting. 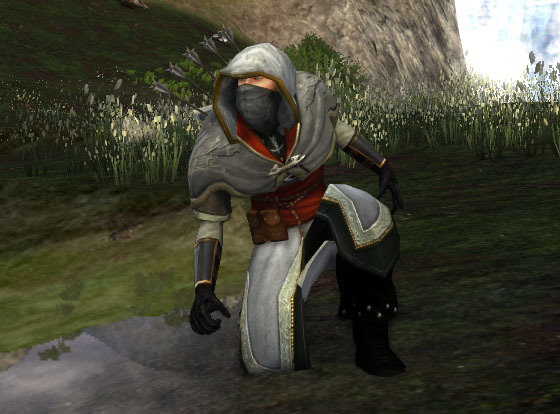 It’s great for stealthy type characters and it’s grey color blends perfect with the default warsteed color for those, like me, who are having a bit of trouble stomaching the high Lotro Store prices for warsteed customization. 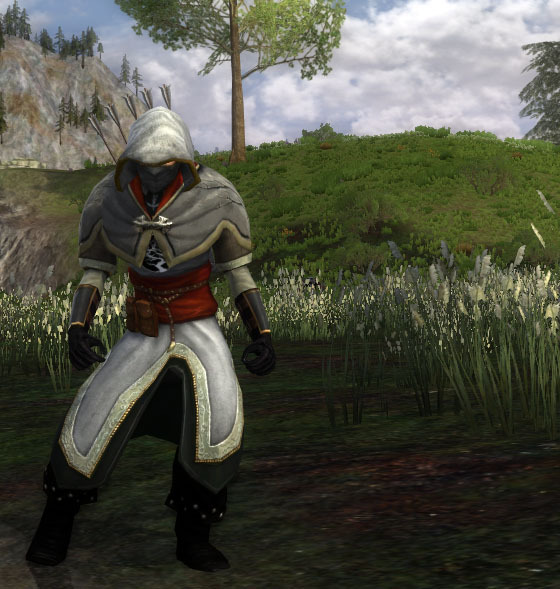 The robe and gloves in this outfit are quest rewards from Rohan. There are not a lot of uniqueness between the different Rohan quest rewards. 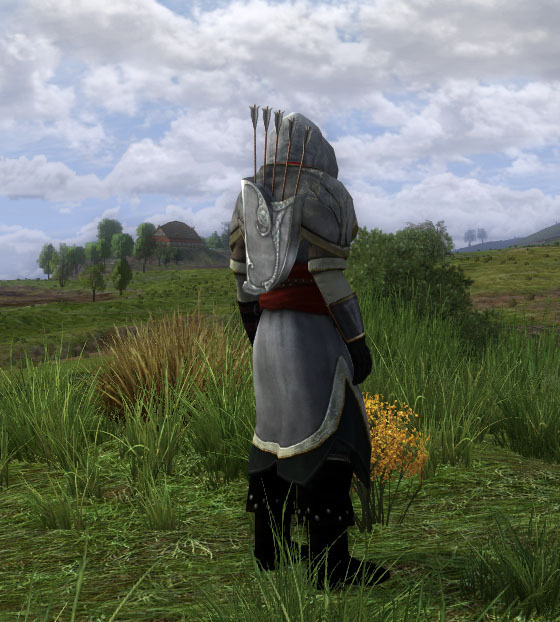 Most of the armour designs are recycled often throughout the quests. I wouldn’t even suggest holding on to the quest rewards for too long since the Hytbold armour designs look exactly the same as well. That being said though, I do really like the silhouette of this robe design. I can see many outfit possibilities. 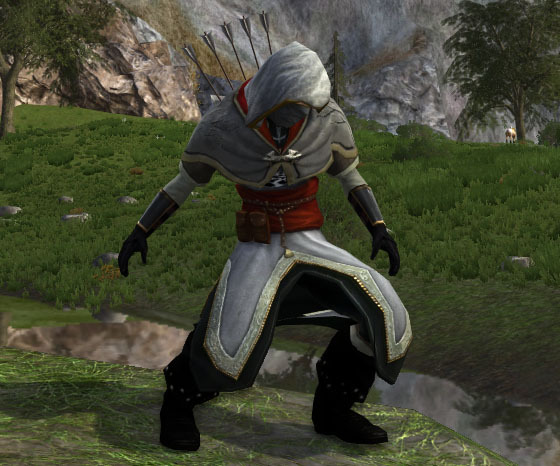 Another great ranger outfit, and in the same spirit as his Assassin’s Creed outfit, yet with a different chest piece. I actually like this one better! What a great sillhouette! He looks very stealthy. I really love how the shoulders mirror the shape of the bottom of the robe, and how the trim colours are such a close match as well. And then the two splashes of red. Really nice! Well done! I have been playing with some outfit ideas myself. This is fantastic though. Hey I have a dwarf champ lvl 9 in silverlode server where can I get decent looking armours that’s at about lvl 10-20 because I can lvl up real fast. I see that your a pro at this so I’m asking advice from you Devonna. 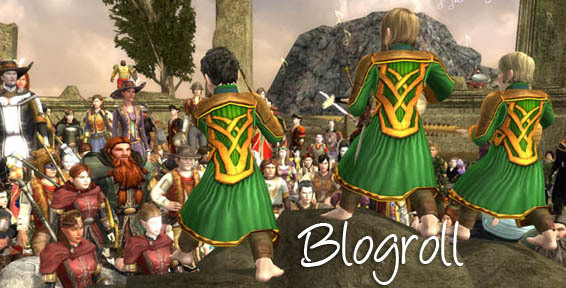 Oh no…has this blog been abandoned? Devonna, you were my favorite outfitter!